It's a one layer card today using some Penny Black stamps. I don't make one layer cards very often but I do love the the process of simple stamping like this, it's very relaxing and therapeutic. 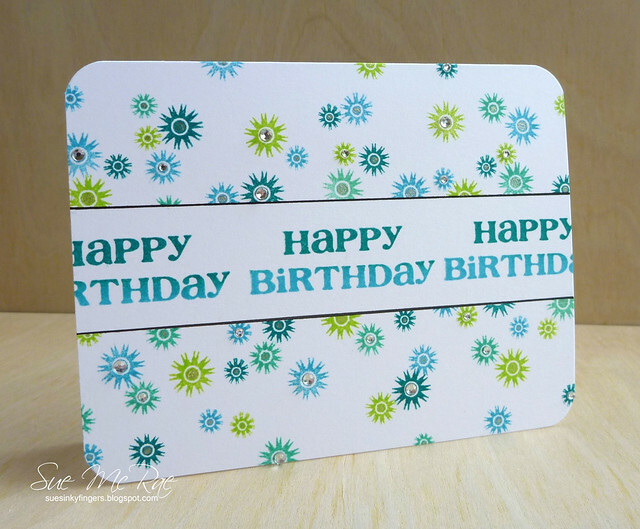 This card uses different ocean shades with three sizes of these cute little flower/starburst images. I wanted to bling up the card so I added clear gems to some images and coloured in the flower centres with a Stardust Pen for the others. Love the sparkle. Love this gorgeous colors combo, Sue - so fresh and bright! Beautiful stamping! Love it! Can I assume you masked the center area before stamping the background?